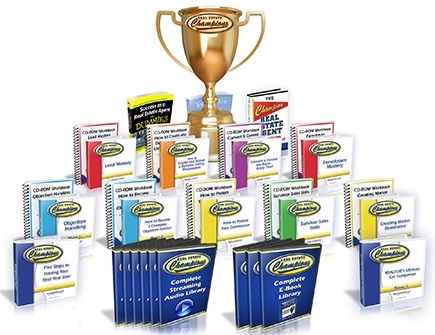 After looking at the complete audio training library we’ve assembled over the last 8 years or so, it’s hard not to feel proud of what we’ve accomplished. It really amounts to the most comprehensive, systemized group of Real Estate Training products ever assembled. My goal was not only to address the topics, but to give you time tested and proven tactics, scripts, dialogues, and tools. That way anyone can use these tools, whether you’re a brand-new Agent or an experienced Agent. Literally, any one of these programs can help you advance your career right out of the box.